Surprise! It's a new season and a new wreath. I go through my closet every year and collect clothes to donate to charity. I have had 6 or 7 tank tops I've been holding on to in my craft junk because I just love the colors. A few weeks ago I decided I needed a new late spring/summer wreath and these colors were perfect. -Cut the whole yard of fabric into 2" strips. 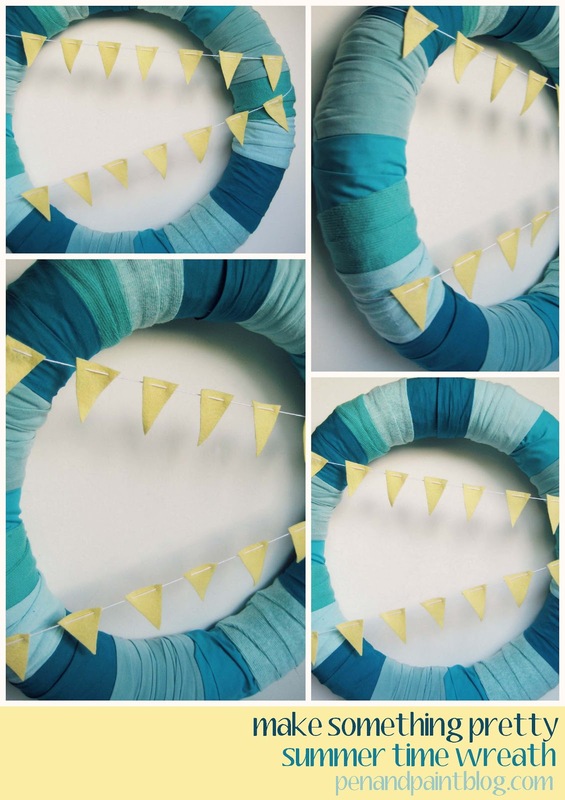 -Hot glue an end of fabric to the back side of the wreath and allow to cool. Then wrap the fabric around the wreath covering the end and and continue wrapping the remaining fabric around the wreath overlapping it so none of the wreath shows through. Once you reach the end of the strip of fabric hot glue the end to the back side of the wreath. Continue until the wreath is completely covered. -Choose your embellishments. I chose to cute little triangles from felt and then strung them on a piece of embroidery thread with a needle. I hot glued the thread to the back of the wreath to make it look like little bunting banners. -Hang your pretty wreath for all to see. Make something pretty and share what you make!